We have been seeing a lot of mid-range devices out of LG lately and what we have here is no different. 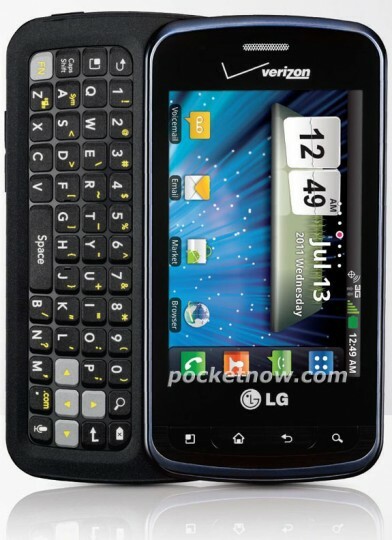 This is the LG Enlighten QWERTY slider headed for the big red, Verizon Wireless. You might also remember the name the LG Gelato Q as that is what this was first rumored to be. More details on that are available in this LG leaked roadmap. If what we have heard is accurate this device might even be rocking NFC but the details are still not all available. While you wont win any design contests or performance benchmarks this is a neat mid-range offering that should be hitting the shelves later in the month or early September and at a great price too. We have a 3.2″ HVGA 480×320 resolution display, an 800 Mhz single-core CPU, a 3.2 MP camera on the rear that sadly is missing a LED flash and you should also get 2GB of internal storage on board here with the included micro SD card. We haven’t heard much regarding this phone but rumors are already stating it will hit Verizon’s shelves come August 25th with an attractive $100 price tag. So while it may be as mid-range as they come (or low-range) you can’t beat the price and it would be a great phone for a first time smartphone buyer, not to mention just in time for back to school shoppers. They might even offer it free with a new 2-year contract but we’ll have to wait and see. Either way it wont cost much and should be hitting stores soon. Next articleHP TouchPad Getting Android 2.3 Gingerbread Port This Week?